You will do yourself a favor if you remove Vaudix from your computer as soon as possible. This application may look like a useful browser extension, but in reality it is there to redirect you to affiliated websites and help its creators make easy money. In other words, Vaudix is an adware program devised to display third-party commercial content. Although we cannot say that adware programs are dangerous malicious infections, they can be the first step towards serious computer security issues, especially if they come bundled with additional programs that are far from reliable. You probably do not even know where Vaudix came from. Actually this application has an official website, and we can access it via vaudix.com. The official website claims that Vaudix is an application that offers you “big data transformation services.” It also goes on to say that Vaudix provides “professional consulting, execution and support services to achieve the high quality and unmatched performance your business deserves.” It all sounds rather nice, but when you think about it, the official website does not provide any clear information of what Vaudix really is and what it does. On top of that, it does not even offer the direct download function. Clicking the DOWNLOAD button does not lead you anywhere, so if you happen to have Vaudix on your computer, it is obvious that you have gotten infected in some other way. According to our researchers, Vaudix belongs to the Multiplug family of adware applications that are all based on the JustPlugIt engine. The family encompasses a vast number of computer infections, all of which are mostly distributed in software packages via the InstallRex, Amonetize, and Vittalia installers. Thus, even though Vaudix is promoted as some application that can provide you with the data transfer service, it is practically identical to FreeDelivry, AutoCouponMaker, Luckey Coupon, BestPricesApp, and many other applications that have been annoying users worldwide for quite some time now. What’s more, apart from Vaudix, you definitely have more unwanted and potentially dangerous applications on-board. We are sure of that because the Multiplug family adware applications are always accompanied by adware helpers that improve their overall functionality and sometimes even restore the deleted applications. Therefore, when you get down to removing Vaudix from your system, make it sure that you delete all the related applications as well because adware might be far hard to get rid of that you think. When manual removal is complete, scan your PC with the SpyHunter free scanner to detect any remaining files that could be used to restore Vaudix and similar infections. You need a watchdog that would protect your computer from harm, and thus investing in a computer security app would be a good solution. When the Charm bar appears click Settings, and go to Control Panel. Open Uninstall a program and remove Vaudix. Go to Uninstall a program and remove Vaudix. 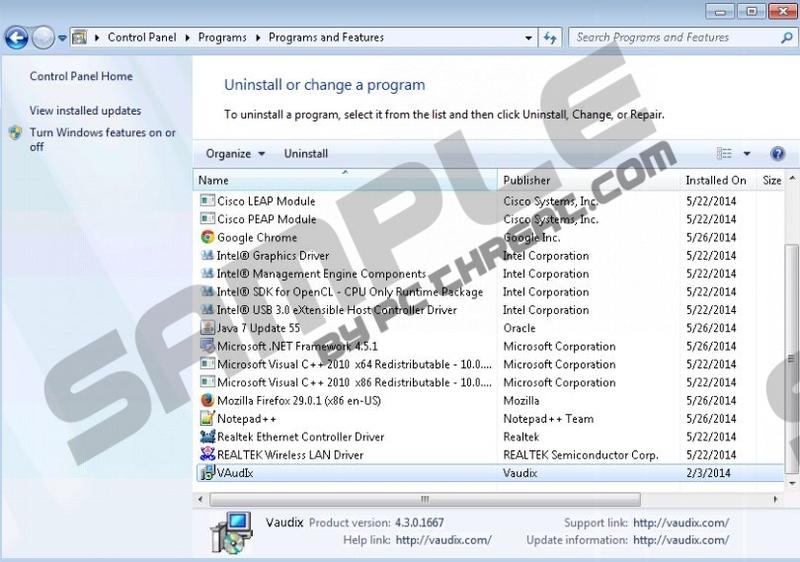 Select Add or remove programs and uninstall Vaudix. Disable and remove Vaudix from Extensions. Open Extensions and remove Vaudix from the list. Quick & tested solution for Vaudix removal.